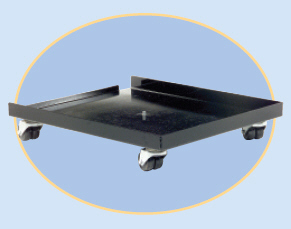 Electronic Cabinet Dolly - Roll-A-Way Conveyors Inc.
12 gauge steel construction, 23-1/8” x 19-1/8” deck with 1-1/2” LIP on 3 sides. 5/8” lip on front side. Four hard rubber dual wheel swivel casters for stability and low over-all height. Ideal for hospital equipment, computer cabinets, sound equipment, and institutional use. Optional grounding chain available. Powder coated black.